The Matilda II (A12) was an ‘Infantry’ (or ‘I’) tank which was specifically designed to fight in close support of infantry operations, or as the British General Staff defined it, “the role of the infantry tank is the assault in the deliberate battle in conjunction with other supporting arms.” For this role, the requirements for an infantry tank, as the British General Staff saw it, were that the tanks have heavy armour, powerful armament, good obstacle-crossing performance, with reasonable range and speed. It was the second in the British series of infantry tanks, with its predecessor being, the Infantry Tank Mark I, Matilda I (A11). 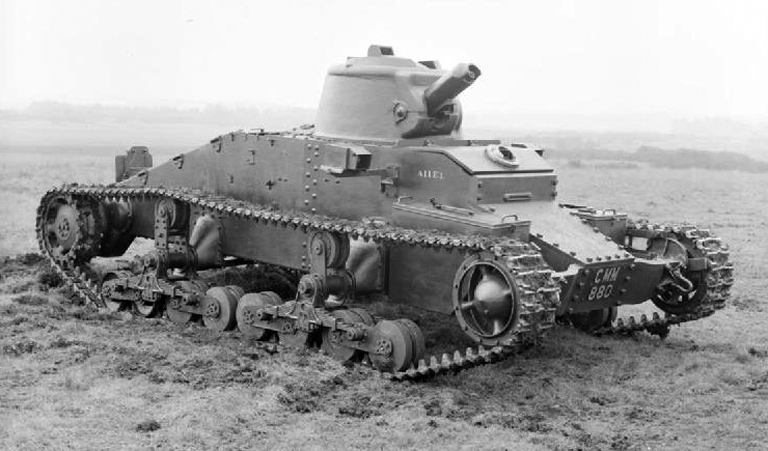 A 3/4 front view of the pilot model of the Infantry Tank Mark I, Matilda I (A11), designated A11E1 (and baring the War Department number T1724, and the Road Registration number CMM 880), which was delivered for trials in September 1936, to the British Mechanization Experimental Establishment, Farnborough, Hampshire. Source: IWM (KID 68). Mechanization Experimental Establishment. By November 1939, the limitations of the solitaire machine gun armament (either one .303-inch Vickers machine gun, or one .50-inch Vickers machine gun) of the A11, and the need for better armoured protection of the crew, and for greater firepower, lead, to the design of the Infantry Tank Mark II, Matilda II (A12), since to incorporate the needed improvements, was not feasible with the basic A11 design. Source: IWM (KID 158). A brief note on the nomenclature (names) used by the British for the various variants of the Infantry Tank Mark II, Matilda II (A12). The suffix letter ‘A’ denoted a change in the armament of the co-axial machine gun, from that of the .303-inch Vickers machine gun, to that of the 7.92-millimetre Besa machine gun. The asterisk denoted that the power units, had been changed over to Leyland twin diesel engines, from that of AEC twin diesel engines. A 3/4 rear view of the pilot model Infantry Tank Mark II, Matilda II (A12), designated A12EA1 (barring the Road Registration number HMH 786). This pilot model was delivered for trials in April 1938, to the British Mechanization Experimental Establishment, Farnborough, Hampshire. Source: IWM (KID 465). 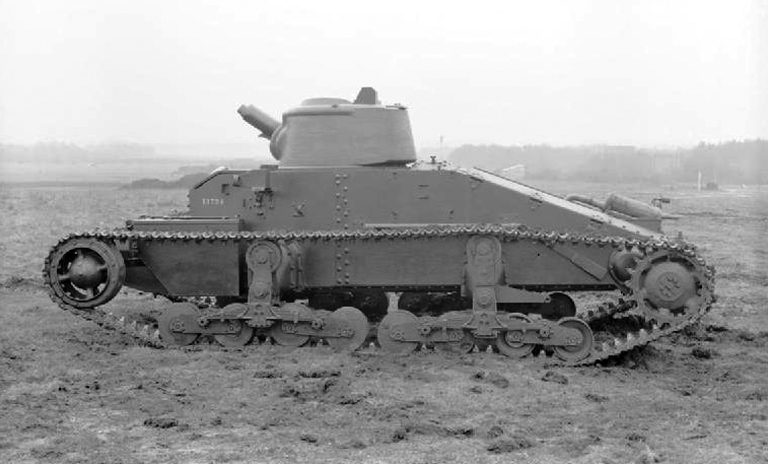 A right-side view of the pilot model Infantry Tank Mark II, Matilda II (A12), A12EA1, while undergoing trails at the British Mechanization Experimental Establishment. A12EA1, was powered by twin commercial AEC straight six-cylinder water-cooled diesel engines, making the Infantry Tank Mark II, Matilda II (A12), the first British tank in service to use diesel engines. Source: IWM (KID 1542). Prior to June 1940, the Infantry Tank Mark II, the Infantry Tank Mark IIA, and the Infantry Tank Mark IIA*, had been simply known as the A12. As of 11 June 1940, to differentiate the various changes in armament or power units, the nomenclature was further broken down by designating the Matilda, whose co-axial machine gun was that of the .303-inch Vickers machine gun, and whose power units were AEC twin diesel engines, the Infantry Tank Mark II. Those with the 7.92-millimetre Besa co-axial machine gun, and whose power units were AEC twin diesel engines, were designated the Infantry Tank Mark IIA, while those with the 7.92-millimetre Besa co-axial machine gun, and whose power units were Leyland twin diesel engines, was designated the Infantry Tank Mark IIA*. As of July 1941, the nomenclature of the Matilda was changed yet again. The Infantry Tank Mark II, was designated the Matilda I, while the Infantry Tank Mark IIA, was designated the Matilda II, and the Infantry Tank Mark IIA*, was designated the Matilda III. The main Canadian Army Overseas users of the Matilda tank were the 12th Canadian Army Tank Battalion (The Three Rivers Regiment (Tank)), and 14th Canadian Army Tank Battalion (The Calgary Regiment (Tank)), of the 1st Canadian Army Tank Brigade, and No. 1 Canadian Ordnance Reinforcement Unit. The need for better armoured protection of the crew, and for greater firepower, lead to the design of the Infantry Tank Mark II, Matilda II (A12), since to incorporate the needed improvements was not feasible with the basic Infantry Tank Mark I, Matilda I (A11) design. The new design for the A12, drawn up by the British Mechanization Broad, called for increased armour thickness, a commercial AEC straight six-cylinder water,-cooled diesel engine, and heavy armoured side skirts to protect the suspension. It also called for a crew of four, as opposed to the A11 crew of three, and initially, the design called for a turret mounting two co-axial machine guns as the main armament. This was quickly changed to a three-man turret mounting a 2-pounder anti-tank gun and a co-axial Vickers machine gun. At the time, in view of the A12’s proposed role as that of an infantry tank in close support of infantry operations, there were some who advocated that a main armament capable of firing high explosive rounds should be mounted. The British General Staff however, declared that the Matilda II (A12) was to protect the infantry from enemy tanks, and thus the 2-pounder anti-tank gun, which at the time was the best anti-tank gun in the world, was to be used as the main armament. However, an agreement was reached whereby the turret should be made capable of mounting a 3-inch howitzer1 as an alternative to the 2-pounder anti-tank gun, which was only envisioned at the time, and that the howitzer was only required to fire smoke rounds as cover for gun tanks. 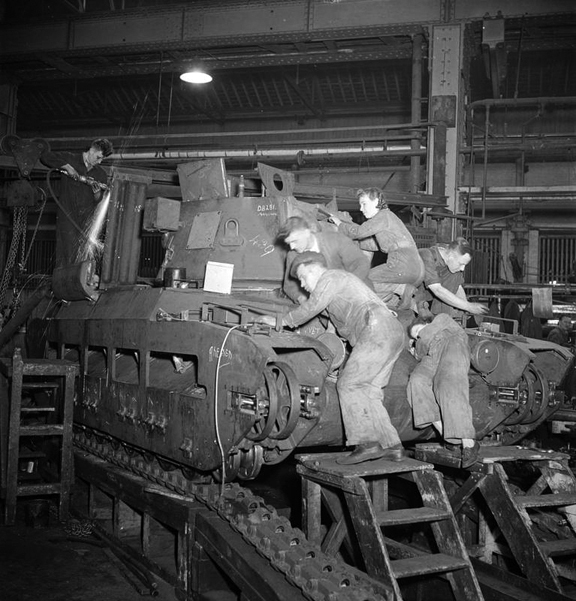 Work is finished off on a Matilda tank, at a factory somewhere in the United Kingdom. Note the grinding down of rough surfaces, which is being done by a worker on the rear deck. Source: IWM (D 9191). In November 1936, Vulcan Foundry Ltd., of Warrington, Lancashire, was directed to produce a wooden mock-up of the A12 design. The mock-up was inspected in April 1937, by which time the British Mechanization Broad had decided to use twin AEC diesel engines coupled together instead of just one AEC diesel engine. Each engine was capable of delivering a maximum 87-brake horsepower2 at 2,000-rotations-per-minute. 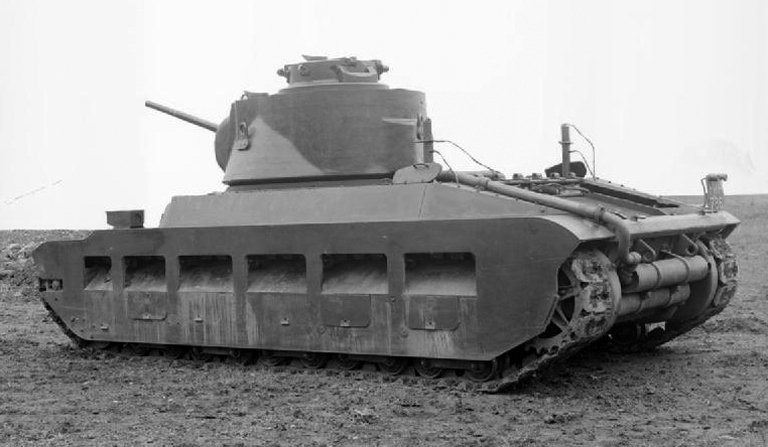 The Matilda II (A12) was the first British tank in service to use diesel engines. Having accepted the mock-up, Vulcan Foundry was directed to produce two pilot models of mild steel construction (with the assigned designations of A12EA1 and A12E2, bearing the War Department numbers T-3431 and T-3432, respectively – Contract No. T.3951, dated 25 May 1937). Construction of the pilot models was however held up by the delay in the delivery of component parts and it wasn’t until April 1938, that the A12EA1 (War Department number T-3431) pilot was delivered for trials to the British Mechanization Experimental Establishment, at Farnborough, Hampshire. Trials were generally satisfactory, but some small modifications were needed to the gearbox, suspension and cooling system. In June 1938, an initial order for 140 Matilda II (A12) tanks was placed with the Vulcan Foundry Ltd., followed in August by an order for 40 more which were manufactured at the Grantham, Lincolnshire, site of Ruston & Hornsby Ltd., under Vulcan, who were responsible for overall production. As the threat of war became a reality other firms, all operating under the leadership of the Vulcan Foundry Ltd., began the manufacture of the Matilda II (A12). These firms were, the John Fowler & Co., of Leeds, West Yorkshire, the North British Locomotive Company of Glasgow, Scotland, Harland & Wolff of Belfast, Northern Ireland, and the London, Midland & Scottish Railway Company at their Horwich Locomotive Works site. Vulcan Foundry Ltd.’s own production line for Matilda II (A12) was located at their Locomotive Works, Newton-le-Willows, Lancashire. 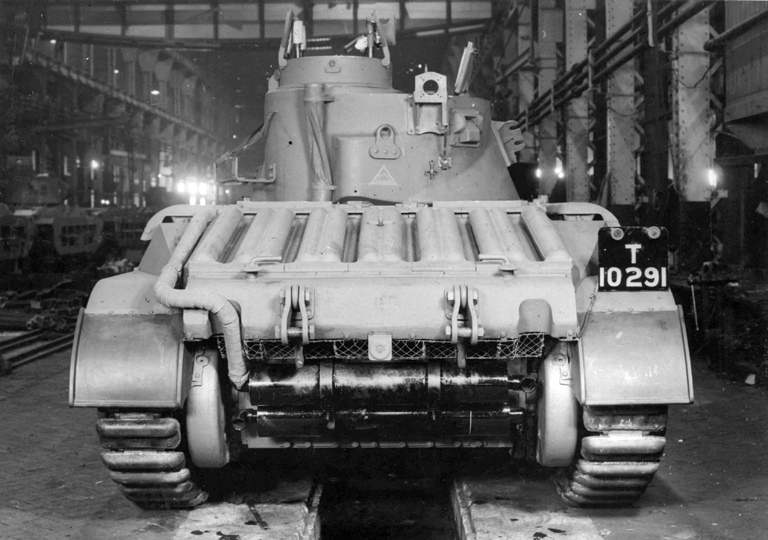 Generic fittings and electrical equipment that each Matilda tank was to have, was supplied to the firms working under Vulcan’s direction from a vast number of suppliers within the United Kingdom. 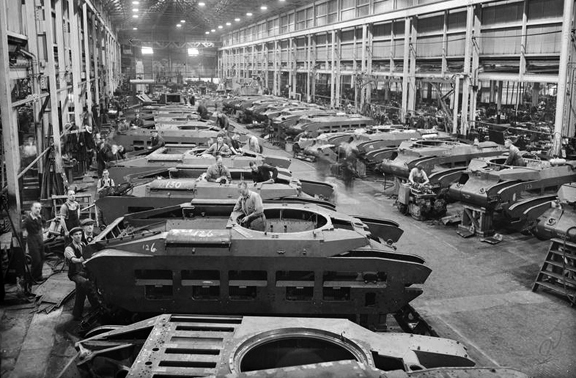 The view of a busy Matilda tank assembly line, at a factory somewhere in the United Kingdom. Source: IWM (P 58). As noted in the text, the Mark II Matilda II, and the Mark IIA Matilda II, that were powered by twin AEC diesel engines, could be identified from the rear, by the simple fact, that only one exhaust pipe ran down the left side of the engine deck, as can be seen here on the rear of T10291, a Mark II, Matilda II. Source: authors’ collection. 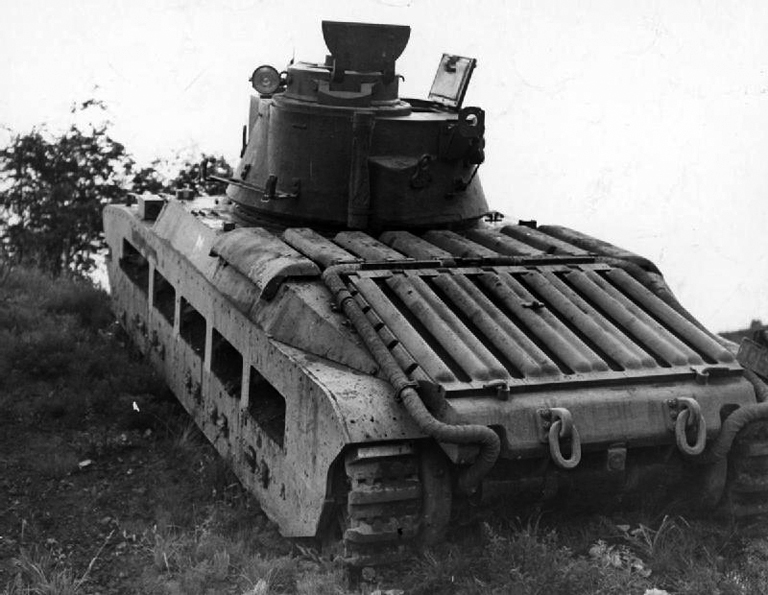 The most significant factor in the A12 design, was its armour protection, which at the time could withstand any known anti-tank gun and most other known forms of artillery. 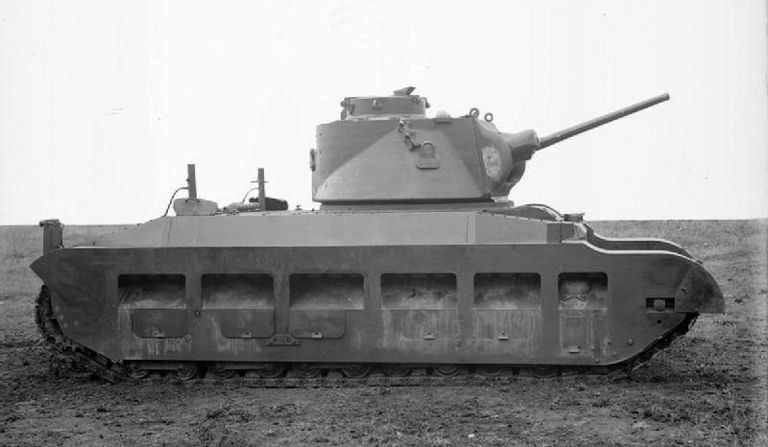 The Matilda II (A12) tank was not easily massed-produced. The hull of the Matilda II (A12) was constructed differently than those of most other tanks in that it was built up of specially shaped armour and mild steel castings, and from armour steel plates secured together by rivets and screws, which were so constructed as to form a rigid structure, whereas other tanks used a frame on to which plates were built. The size and shape of its mixture of armoured rolled plates and castings, gave the Matilda II (A12) great strength but demanded a vast amount of specialist skills during the manufacturing process. In areas where these armoured castings were too thick they had to be ground away from the inside, a very time consuming task which required skilled craftsman to carry out. In addition to the hull proper, armoured side protection (skirting) plates carried from the hull on cast steel brackets were provided to give additional protection from gun fire. The interior of the hull was divided into three compartments, the driver’s compartment, the fighting compartment, and the rear compartment (or engine housing) which housed the power units (engines) and transmission gear. Side panniers were provided along the hull sides above the track tunnels. Mud chute plates, designed to protect the suspension gear from mud and stones carried over by the tracks, were provided between the hull sides and the armoured side protection (skirting) plates. As noted in the text, those Matilda tanks that were powered by twin Leyland diesel engines (the Mark IIA* Matilda III onwards), could be identified by an exhaust pipe running down both sides of the engine deck, as seen in this photo. Source: authors’ collection. Contract No. 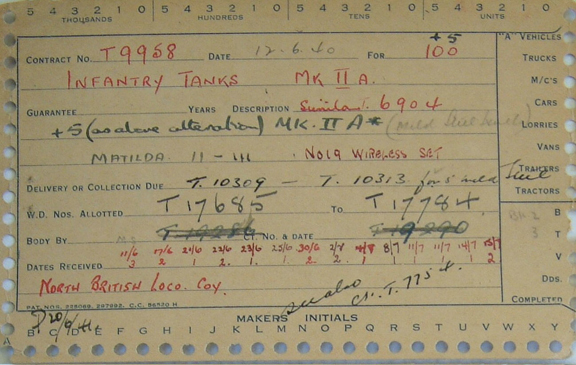 T.9958 (dated 12 June 1940), to the North British Locomotive Company, under which the highest number (18) of Mark IIA* Matilda III tanks issued to the Canadian Army Overseas was built. Source: authors’ collection. As a point of interest, the Mark II Matilda II and the Mark IIA Matilda II, powered by twin AEC diesel engines, could be identified from the rear by the one exhaust pipe which ran down the left side of the engine deck, with the other emerging from underneath the hull. Those powered by twin Leyland diesel engines (the Mark IIA* Matilda III onwards) had an exhaust pipe running down both sides of the engine deck. On all Matildas these exhaust pipes ended in a pair of silencers (a device for reducing noise) mounted across the back of the hull, beneath the overhanging rear deck. Over all, by August 1943, when production of the Infantry Tank Mark II, Matilda II (A12) ended, the British had built approximately 2900 (inclusive of the two pilots) Matilda II (A12) tanks. Contract No. T.5115 (dated 11 June 1938) (the initial contract) – built by Vulcan Foundry Ltd.
Contract No. T.5693 (dated 24 October 1938) – built by John Fowler & Company Ltd.
Contract No. T.6905 (dated 19 April 1939) – built by Harland & Wolff Ltd.
Contract No. T.6906 (dated 19 April 1939) – built by John Fowler & Company Ltd.
Contract No. T.6907 (dated 19 April 1939) – built by Ruston & Hornsby Ltd.
Contract No. T.6929 (dated 19 April 1939) – built by Vulcan Foundry Ltd.
Contract No. T.9959 (dated 12 June 1940) – built by Ruston & Hornsby Ltd.
Contract No. T.311 (dated 26 July 1940) – built by Vulcan Foundry Ltd.
1. A relatively short barreled gun for firing shells at a high angle. 2. Brake horsepower is the measure of an engine’s horsepower before the loss in power caused by the gearbox and drive train.